Having produced extensive lists of most of the 9.5mm cine camaras and projectors marketed over the years from the early 1920s through to the 1980s or so when home movies had really gone into decline with the onslaught of video; I have suddenly realised that we don't have lists of the various accessories necessary for the making and showing of cine films. Sadly few if any of the items listed below are available to buy new these days, but maybe some will turn up at cine fairs, car boot sales, on that internet auction site e-bay and maybe even on my (this) web-site sales lists! We had better start with the originators of the 9.5mm film format, although some of their accessories were perhaps not the best. In the 1920s onwards, the equipment was made in France. Once Pathéscope had their own UK factory at Cricklewood some equipment was manufactured or assembled over here. After the second world war more production was in the UK. 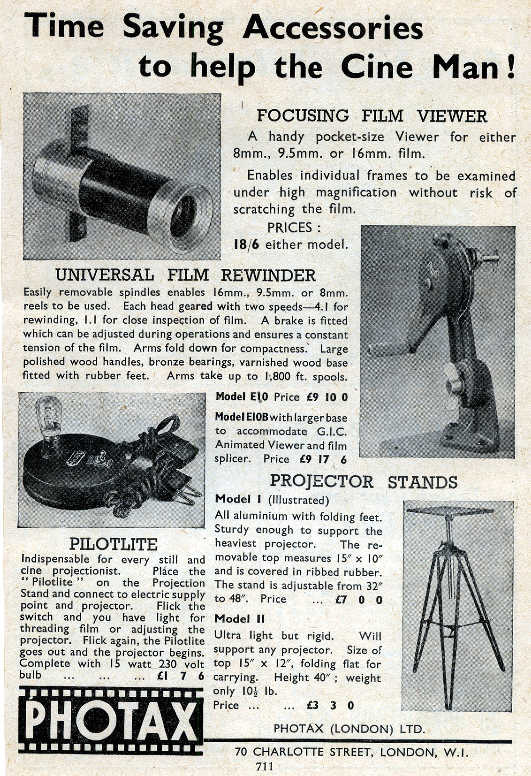 Actina were certainly active in the 1950s, as a teenager I remember the various cine items that they distributed, including many items for the 9.5mm film gauge. 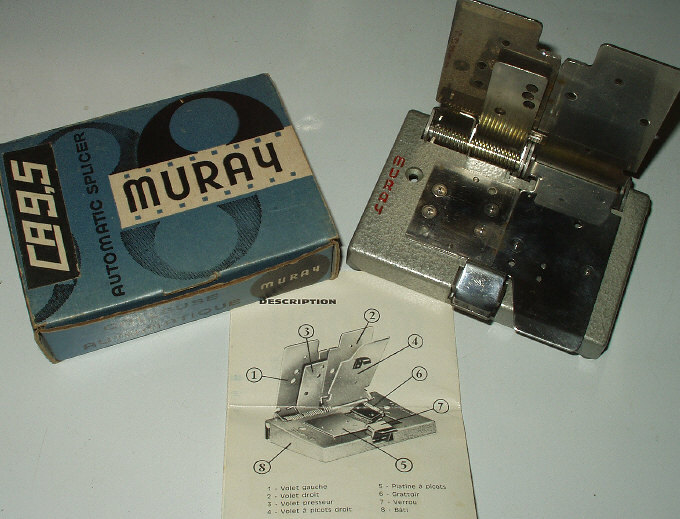 Look further down this page for Ditmar and Muray items for starters. 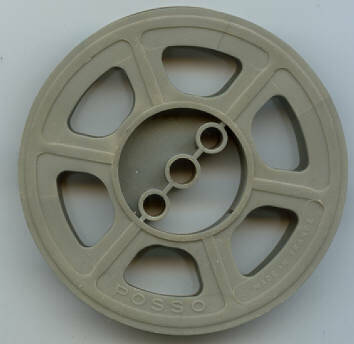 I think the French made 'Posso' cine spools were also distributed by Actina - so also look furtther down the page for these. Actina marketed some products under their own name. Certainly the aluminium cine spools, although probably made for them in France, were marked 'Actina', hence I have addded a section for themselves here. I used to buy the plastic 9.5mm spools and cases from a local shop, until Pathéscope introduced their new spools (made by Marguet in France I think). 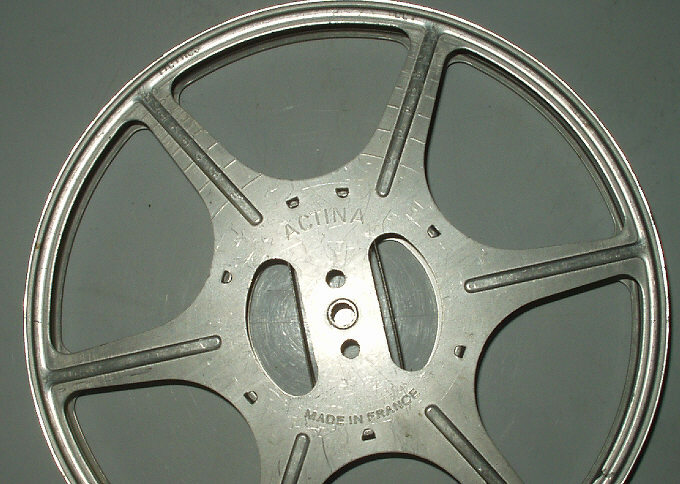 There are a few Actina 9.5mm aluminium spools in my collection, mostly lurking in projector boxes. I just didn't like the plain metal finish, as the Pathéscope 'easiload' ones although metal, were finished in grey or brown crackle paint. Just remembered 'Cecol' cine spools when I spotted this Actina advert in the ACW magazine. The larger spools were fine for 16mm, but the 400ft aluminium 9.5mm and 16mm spools, although taking a good 400ft of film, had rather small centres, tending to make film ends a bit curly! Hence I don't normally use them. Maybe these were made in the UK in the days when we actually manufactured things! Cinecraft Supplies I believe were trading from the 1930s, supplying various accessories for the amateur movie enthusiast. 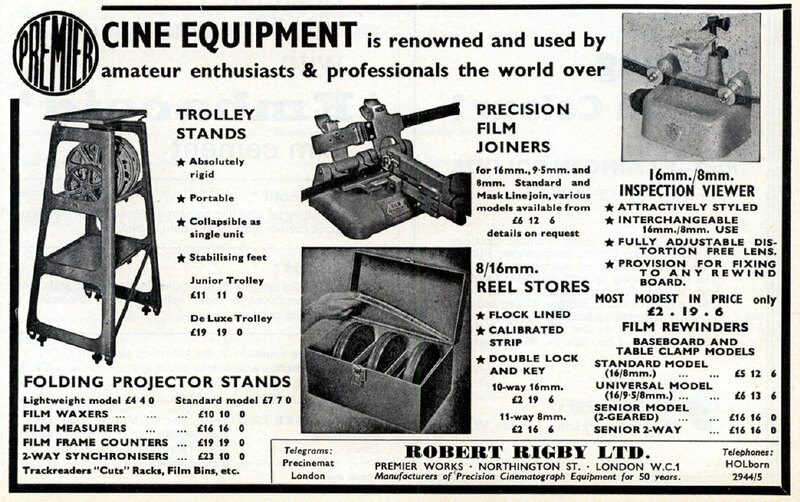 As we see from the advertisement below, certainly film rewinders, a titling outfit and I recall, a range of projection spools. 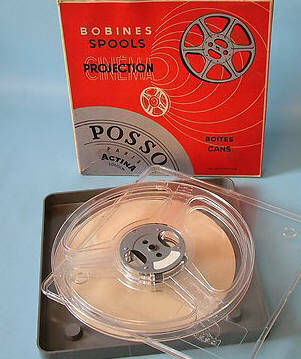 The film rewinders were later distributed by Pathéscope in the UK and these maybe actually bore the Pathéscope name at one time. Illustration in the Harold B. Abbott book "The Complete 9.5mm Cinematographer"
Reading back numbers of the Amateur Cine world magazine I realised that 'spools' are definitely classified as a cine accessory, so decided to begin to include them in these lists. The British made 'Cyldon' cine spools have always seemed popular - many films on all gauges seem to turn up mounted on these aluminium spools. Manufactured down here in Poole, near Bournemouth, I recall the company Sydney S. Bird also made many thousands of TV convertors when the commercial television channel arrived in the late 1950s. I have never liked these spools because the centre of the 200 foot and 400 foot reels is far too small a diameter. It tends to give the end of a film too much 'curl', and when used as the take-up spool often gives too much 'pull' or in some cases doesn't take-up properly at the start of a film. At least they are quite sturdy and being aluminium tend to survive rusting although they can suffer a type of corrosion if stored in a damp atmosphere. Being non-magnetic, they can be used with magnetically striped films. Personally, I try to avoid them, except for the 800 foot versions, useful in 9.5mm and 16mm. A quick 'google' shows that the company began in the 1930s, based in Enfield, Middlesex, making walkie-talkie radios and general electronic equipment. They also made various toys using the brand name 'Cyldon', including toy cookers, washing machines and steam engines! After the war they moved in 1953 to new factories in Poole, Dorset. Eventually they were employing more than 1000 workers. The range of electronic products now included electronic organs, which with the 'beat craze' of the 1960s, became big sellers along with guitar amplifiers. A range of companies were formed to produce echo-sounders, radar, marine communincation equipment and even car radios with brands such as Radiomobile and Motorola. A long way from aluninium movie spools! Sadly in March 1981 the receivers were called in - no doubt cheaper foreign imports had put paid to yet another UK manufacturing group. 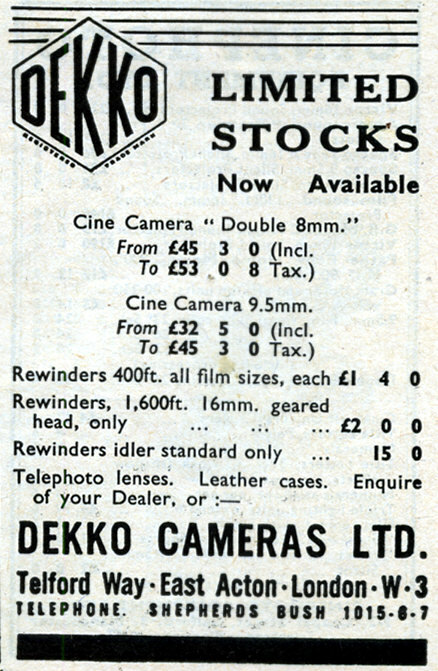 Dekko also produced their own 9.5mm cine spools, 300 foot / 100 metre; sturdy, well made aluminium, with footage markings and brass centre sleeve. Maybe just for 9.5mm, I haven't spotted any for the other gauges yet. Not sure if these were produced just pre-war; post-war or both. 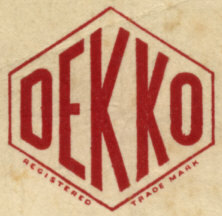 Dekko also produced quite neat rewinders - sold separately or on a rewind bench with one geared head and an idler head. An Austrian company that made some rather nice cine cameras and projectors; I do have one of their splicers, perhaps there are other Ditmar cine accessoriess? 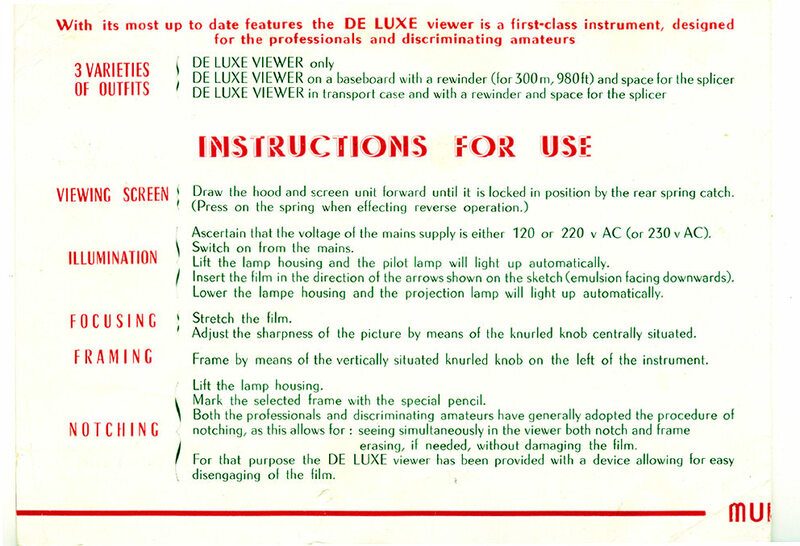 (model 2230), reviewed in the January 1939 Amateur Cine World magazine. This is a later version, earlier ones had a black finish metal frame. This must be a later (post-war) model - intended for single perf. 16mm to provide for talkie prints. Obviously these were imported into the UK, and at a reasonable price for a tri-gauge splicer. Maybe I'll spot one somewhere to add to my collection! A French company which produced a neat cine projector and a 50 foot / 15 metre spool loading cine camera in all film gauges. 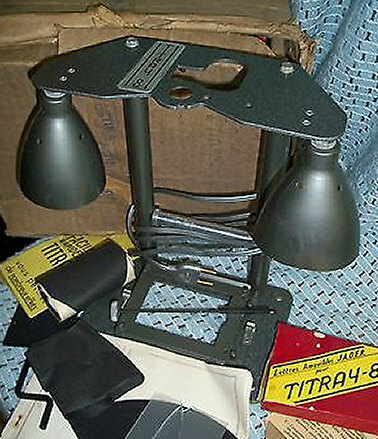 Seems the German Hähnel company must have been in business for many years, as I have just spotted a vintage Hahnel blow-lamp on ebay! the electronics side of imaging - remote radio contrrolled shutter releases etc. 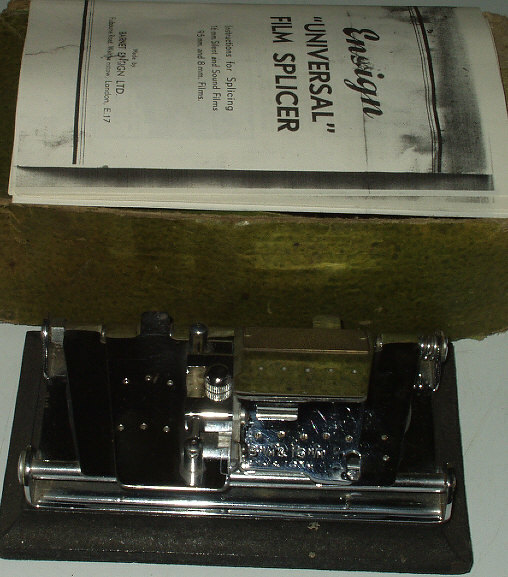 It was in the 1960s that Hähnel produced a clever film splicer that used a motor driven fine grinding wheel to clean the ends of the film before splicing. well, that's what the marketing said anyway! I seem to recall that my 8mm efforts turned out to be a bit weak, often snapping after a few showings! 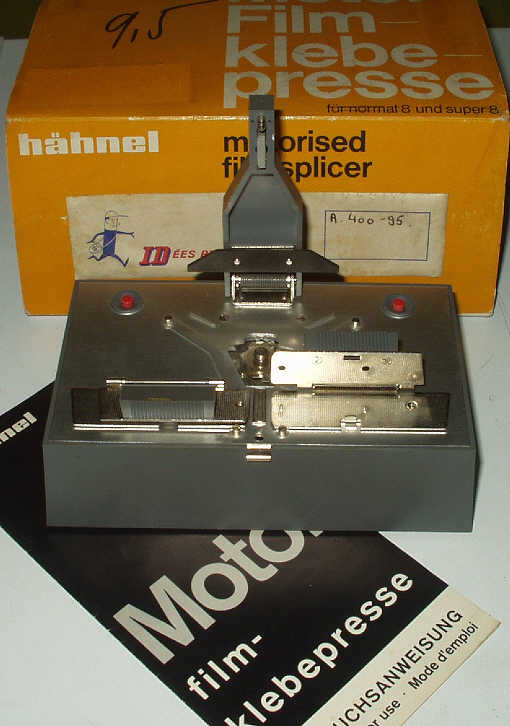 However in addition to the std/super 8mm model, Hähnel produced a 9.5mm Collmatic film splicer - 'automatic scraping of both film ends with electrically driven sapphire wheel. 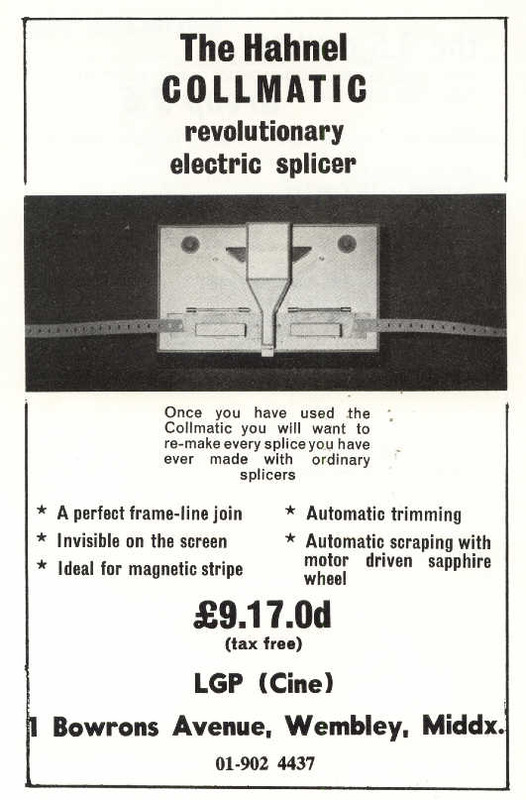 This is the ideal splicer for 9.5mm as the whole splice is within the broad frame line and the bevelled join does not jump in projector gates and smooths the path of magnetic stripe over sound heads' - well that's what the entry in the Group 9.5 magzazine "The 9.5 Review" said in the October 1969 issue! The innards - think it takes the U2 type batteries - must give this a try! 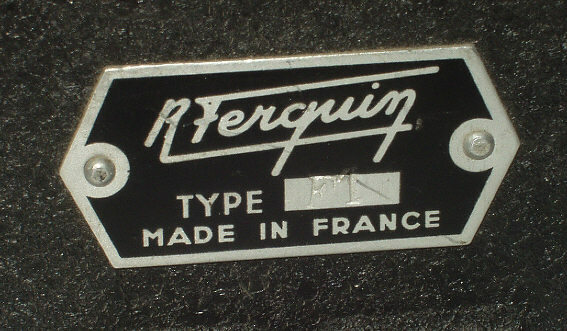 Haynor initially imported the French made Ferquin animated viewer in 1949, then arranged for a more modern model to be made in the UK. 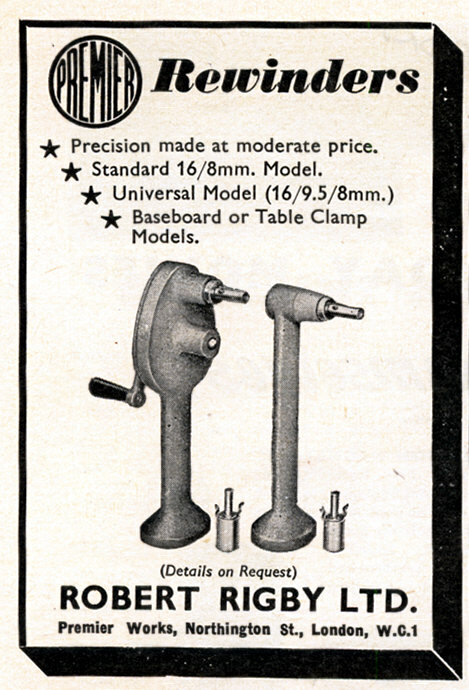 By 1955 both models were supplied in separate versions for 8mm / 9.5mm / 16mm. 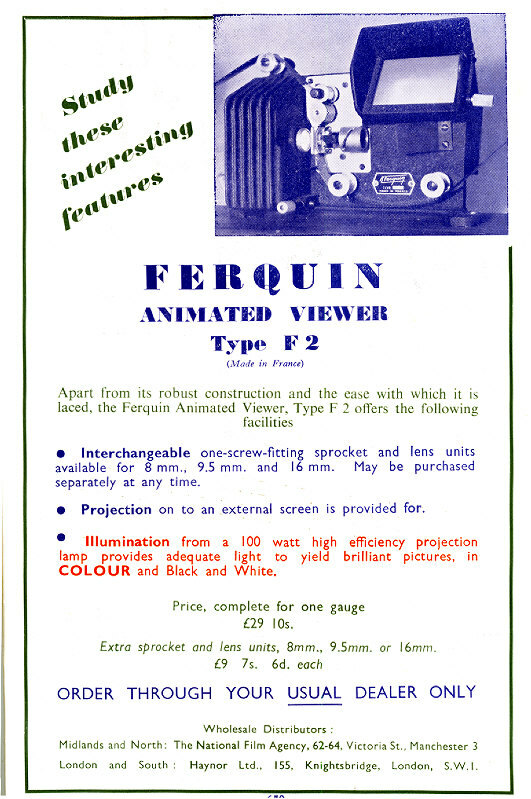 The initial Ferquin animated viewer - the F1, must have been produced in the late 1940s - my example has a British mains plug, so presumably these were also imported to the UK. A simple affair with S.E.S. base 15 watt mains pilot lamp (240 volt for the UK! ), just fits on a rewind bench - very small image through the lens, but handy for editing home movies. 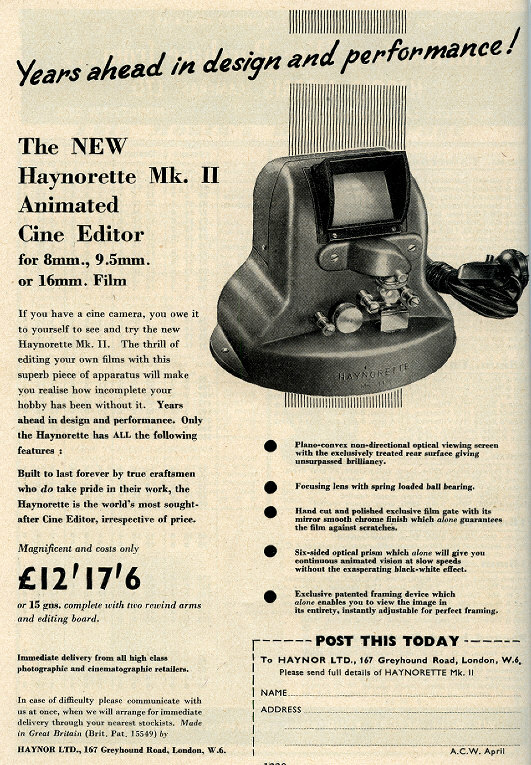 By 1949, the simple F1 animated viewer had been improved as 'Type F2' - there is an advert below; a review appeared in the January 1950 Amateur Cine World magazine. 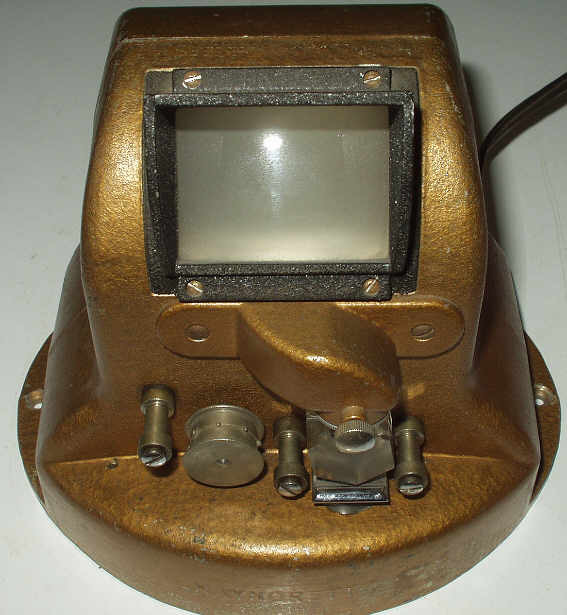 A 12volt 100 watt lamp provided enough light to illuminate a proper viewing screen. So far, I haven't come across one of these. 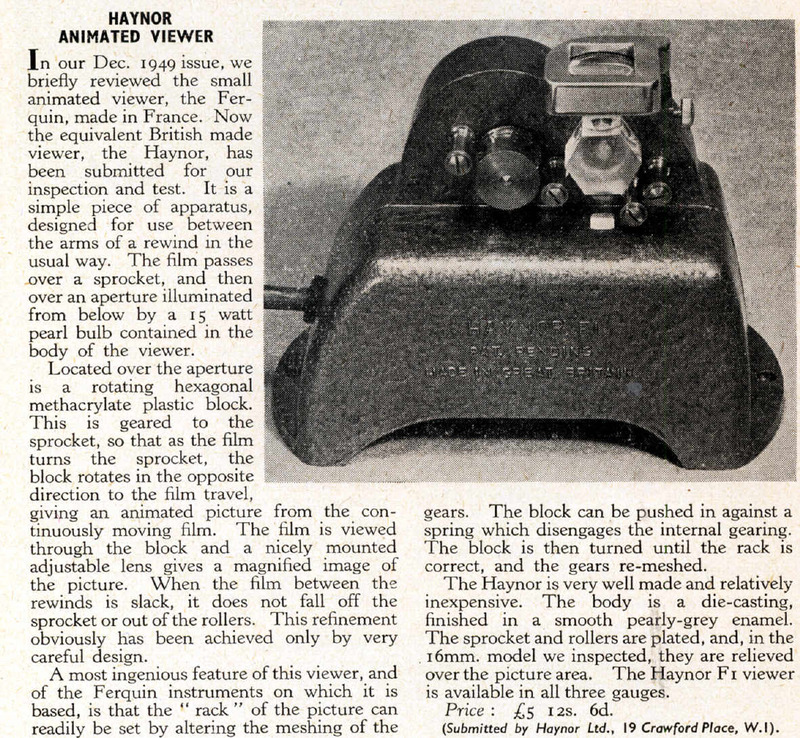 Haynor took the original French Ferquin design, improved it with a single die-casting and a slightly larger magnifying lens. Still named the F1, it just had a tiny 15 watt mains voltage 'Pygmy' bulb. I had a similar model in my youth, but this had a small mains transformer inside (a household electric bell transformer) with a push-button on/off switch and car side-light type bulb. I guess the smaller filament did give a better compact light source. But two-core mains lead of course (and two-pin plug). I used it for editing my 9.5mm efforts during my teens - not sure if it is still upstairs somewhere.... 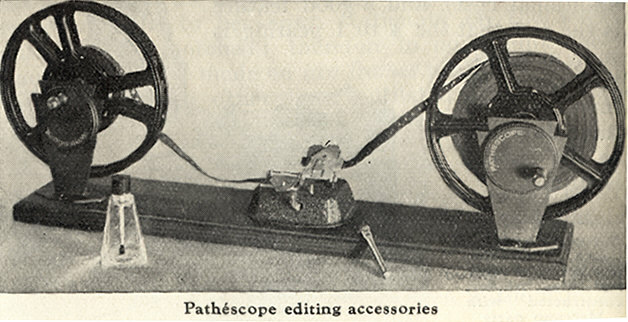 Soon, the 9.5mm model was distributed by Pathéscope in the UK. Nice to have a proper ground glass screen, even if it is a bit small. This British made Haynorette editor Mk 2, had an in-built mains transformer (they used a standard household bell transformer!) to supply the 6 volts for a car sidelight type bayonet (B15d) bulb. Interesting, these used twin contact bulbs, 6 watt I think. I am currently upgrading my example with a push-button mains switch and three-core (earthed) cable and mains plug. I'll also try a 10 watt bulb if the transformer can cope with the small extra load! The focussing knob is obvious; for framing adjustment, just press in the prism wheel itself (it unmeshes the gears), hold the sprocket and rotate to the required position. Like the earllier F1 (or Mk 1 ) above, the 9.5mm model was distributed by Pathéscope in the UK. It is listed in the various mid 1950s Pathéscope price lists. The underneath, not yet fitted with a switch - sorry about the finger! A French (post-war?) 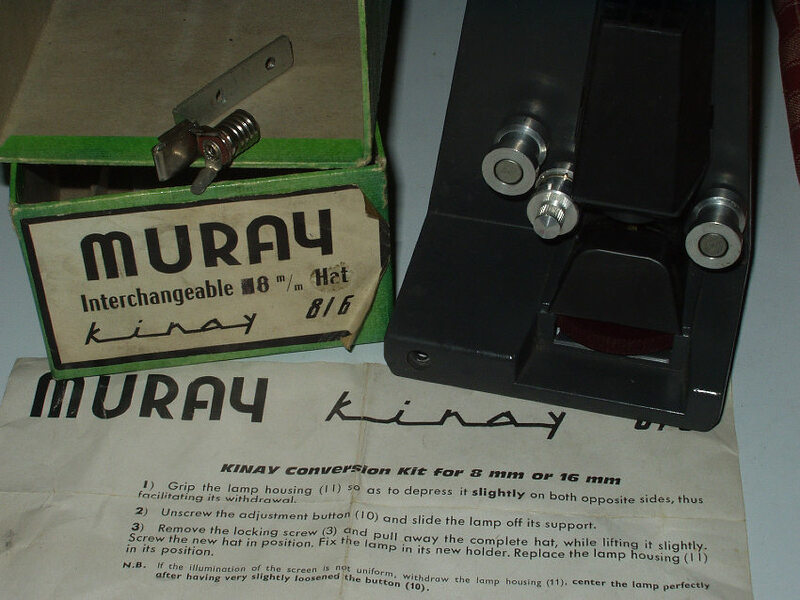 company who produced rewinders and film splicers - originally for 8 / 9.5 / 16mm and later Super 8mm. 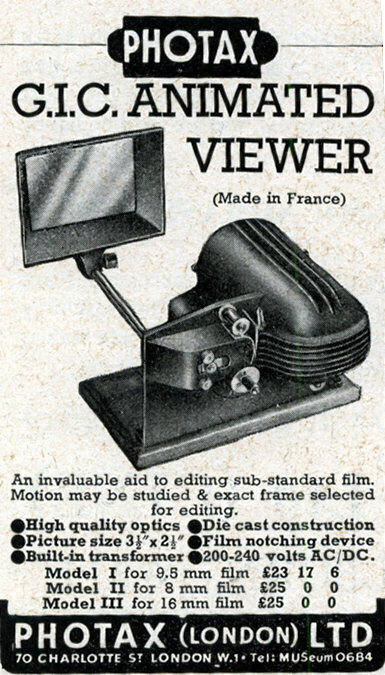 On a French web-site I notice that a Ferquin animated viewer was listed as made by Marguet - can anyone confirm this perhaps? As a teenager with some pocket money, I decided maybe I should equip for all three (8mm /9.5mm /16mm) film gauges. So after much searching and deliberation I purchased a Marguet BN 'automatic' tri-gauge film splicer and Marguet tri-gauge rewinder - both new, from 9.5mm dealer Larry Pearce - later trading as LGP (Cine) - now some 55 or so years later I still have these items and still use them for certain film work! 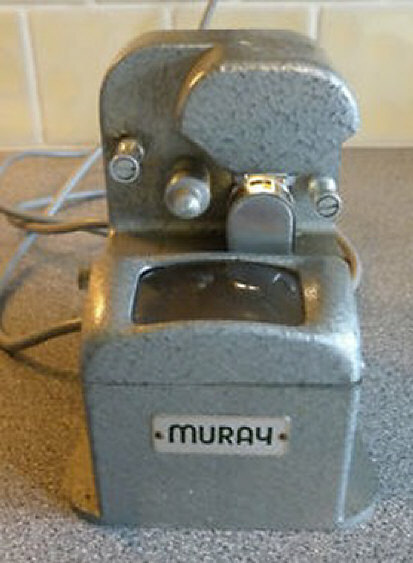 In fact the Marguet rewinder was the one used in my 'darkroom' (understairs cupboard) to wind all those thousands of feet of 9.5mm Fuji and 'Presto' (Konica) filmstock into reloads and onto camera spools! 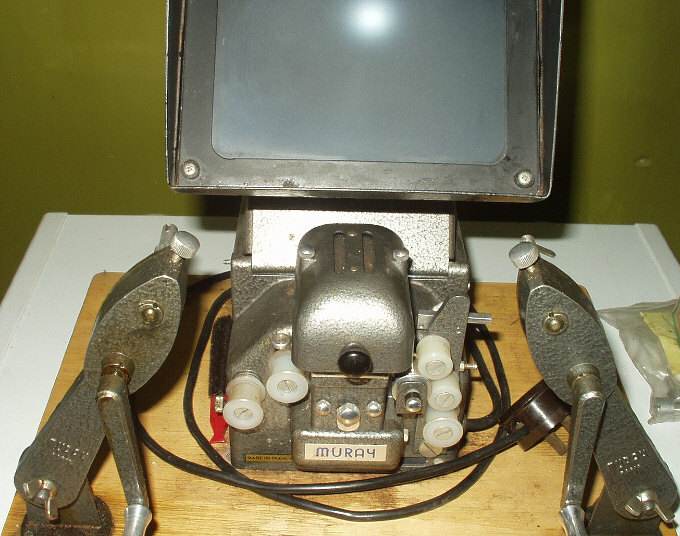 The Marguet / Ferquin animated tri-film viewer (Visionneuse in French to you!) 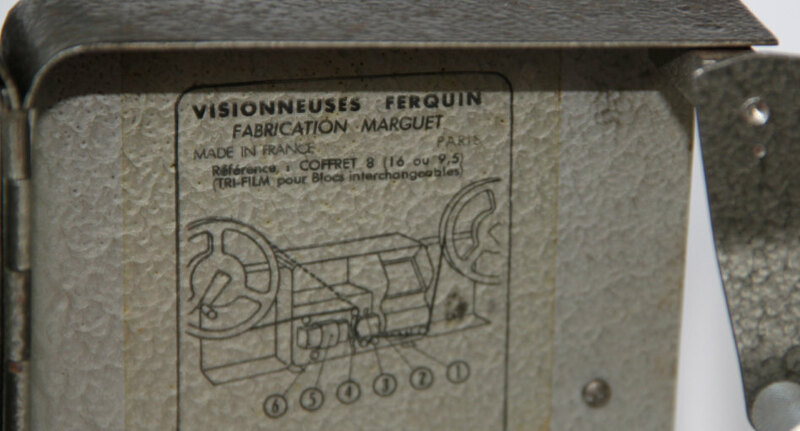 - just confirmed my thoughts - the photos below show the viewer was branded Ferquin, but manufactured by Marguet. Interchangeable blocks were available for 8mm / 9.5mm / 16mm - never set eyes on one though - seems they were not sold in the UK. 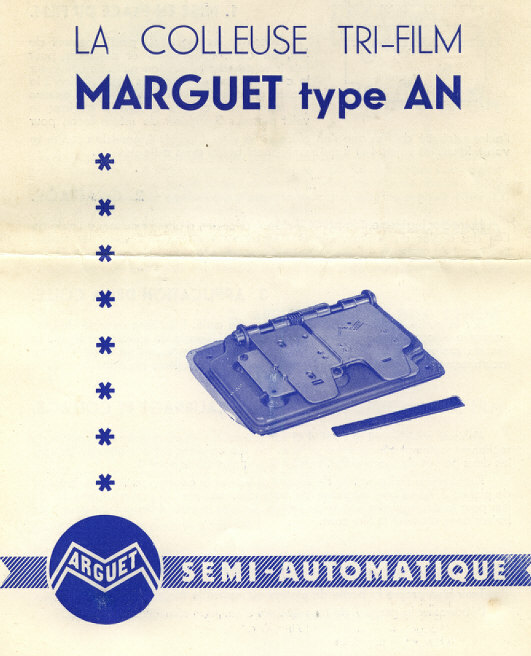 The Marguet type BN 'automatic' film splicer for 8mm/9.5mm/16mm - has built-in cutting and scraping - with a bit of practice, one of the best and easiest cement film splicers to use. They even managed a 'Pro-35' version for 35mm! 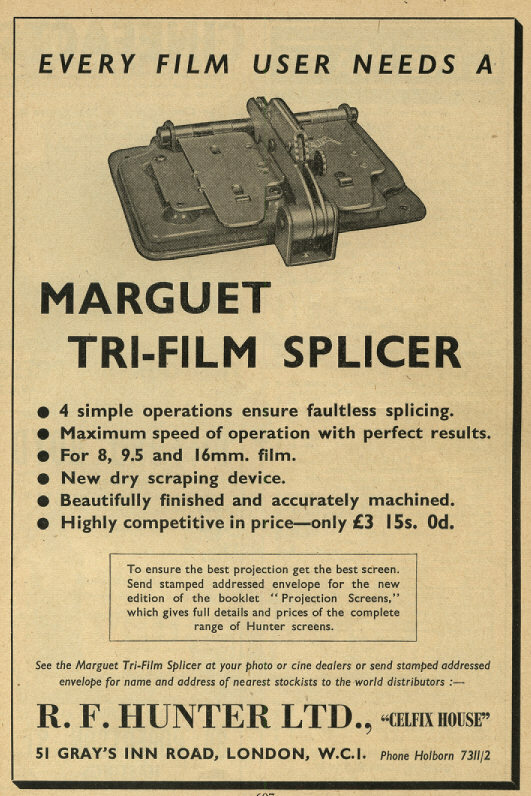 The Marguet type 'AN 'semi-automatic' film splicer for 8/9.5/16mm - smaller cheaper design, separate film scraper. Not the best, but was neater and cheaper. Maybe some were available in single gauge versions?. Marguet Tri-gauge Film Rewinders - Gauge change by adaptors, hence adaptors can be 'home' made for even 17.5mm and 28mm spools. Handle swopped onto spindles for 3:1 geared or direct drive. On the baseboard supplied, OK for spools up to 1000 foot / 300 metres. Maybe mount on standoffs to allow 1600 foot spool capacity. Neat and useful piece of kit! My own Marguet rewinders - these have had a fair bit of use since my teenage years!! Think the better 'De-Luxe' model was catalogued as the E10 - 4:1 gearing for rewinding, 1:1 for editing. 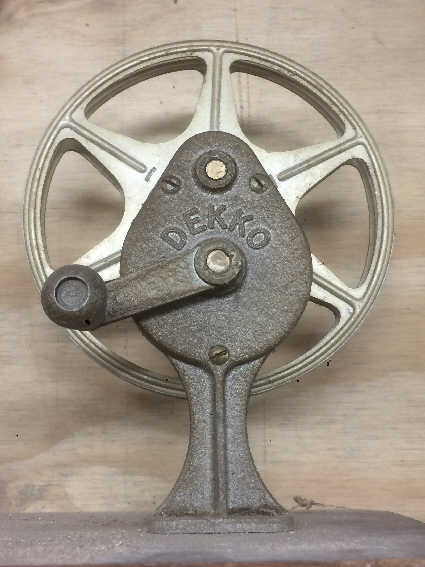 There is also a brake; possibly take up to 2000 foot spools - tri-gauge with spool spindle adaptors. The bigger baseboard had room for fitting an animated viewer and splicer permanently onto the base. Just what is that metal clip for? - I unscrewed the one on my Marguet rewinders and chucked it away! - gear change must be via the lever on top - had that clip on mine, never knew what it was for (film cement perhaps? The Marguet E10 rewinds were reviewed in the Amateur Cine World magazine November 1950. As a matter of accuracy, it appears the French Marguet cine accessories were imported and distributed in the UK by Photax and also by R.F. 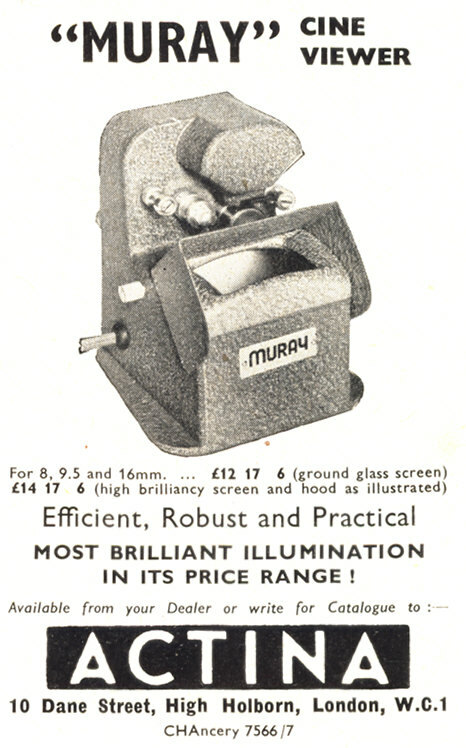 Hunter Ltd. who certainly imported the cine film splicers. Meopta manufactured various cine and optical products, when under communist rule, I think R.F. Dormer imported things like the Admira 8F cine camera. 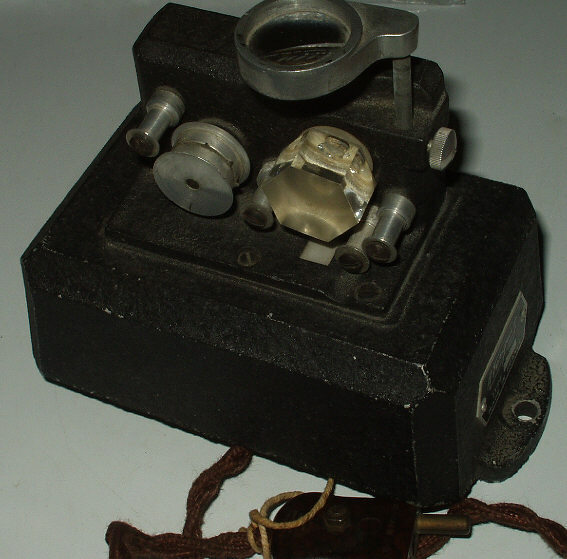 Once free of communism, Meopta launched a modern 16mm sound projector, well two models I guess AS-3 optical.magnetic playback and Electronic 11 with magnetic recording. A batch of these was imported by Douglas Macintosh and the French 9.5 club eventually offered a 9.5mm conversion of these machines. 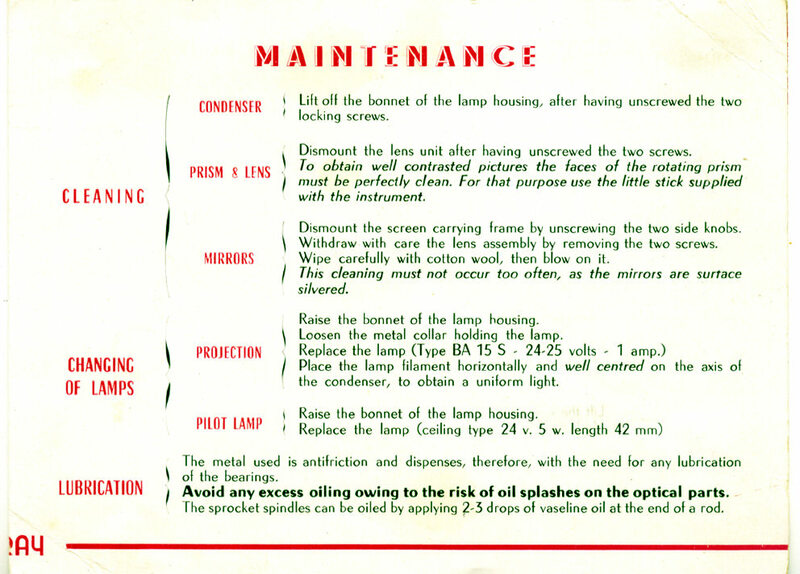 Today the company has been privatised, making optical items like binoculars and telescopes etc. But see Wikipedia for much more useful information! 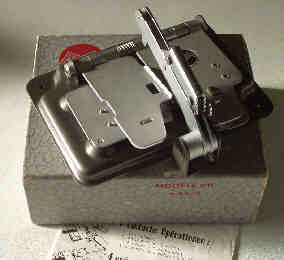 I recall that Meopta did make a 9.5mm cine projector - the Jubilar I think - I must update my equipment lists! 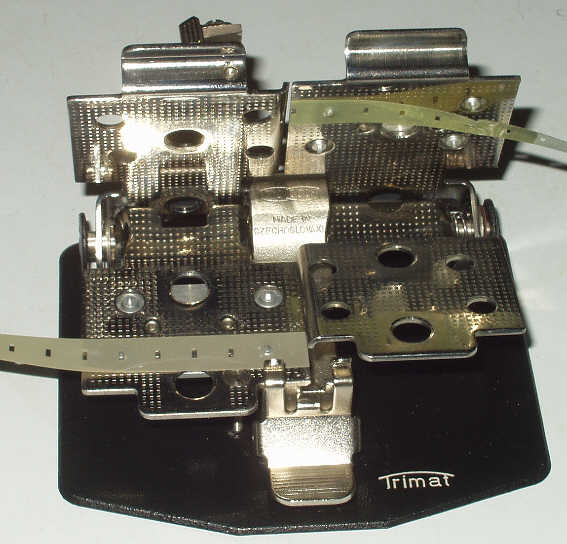 Recently I came across a new Meopta Trimat film splicer. 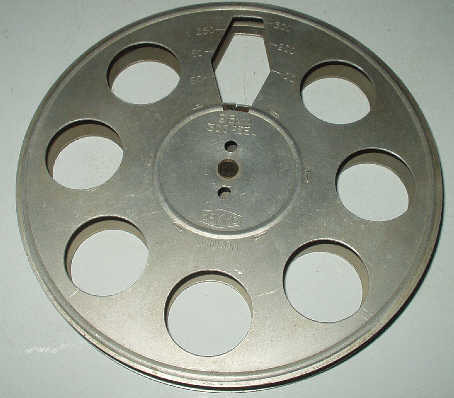 I believe some of these were included with the 16mm Meopta projectors. 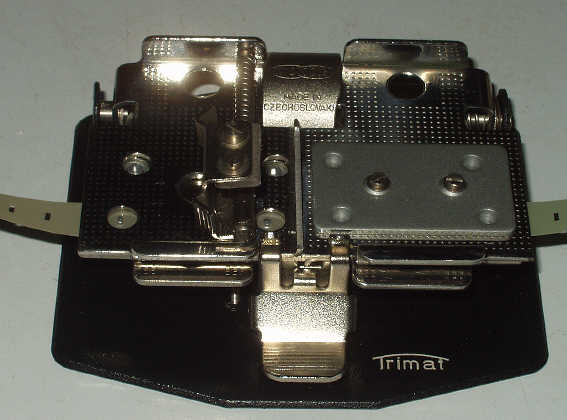 I think the later Trimat splicers were for Super8mm / std 8mm and 16mm. I have yet to check if the one I have is a later Super 8mm model or will take 9.5mm. I have just tried it with 9.5mm, but as I have just noticed the film test length is probably reperforated, hence it will have 16mm perforation pitch, and so the splicer works, but probably not with normal 9.5mm film! Naturally I would have preferred to get the 16mm projector with the splicer, although I guess the sheer weight means it may well have been consigned to a local tip! Eventually a super-attachment was offered for the thing to actually run 300 foot / 100 metre spools. I have just a Midas 9.5mm 300 foot spool whilst sorting bioxes! 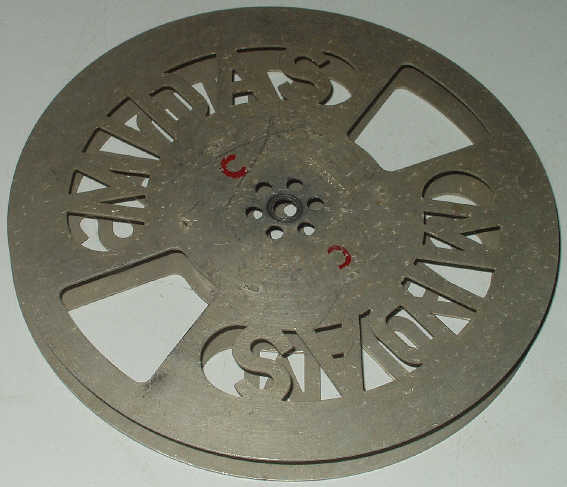 9.5mm Midas 300 foot / 100 metre projection spool - probably quite rare! Another (post-war?) 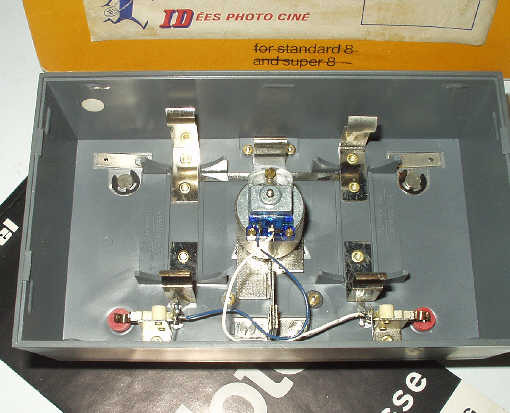 French company whose cine products included splicers, rewinders and animated viewers. Generally imported and distributed in the UK by Actina Ltd.
arms take up to 1000 foot spools - 1600 foot or more if mounted on 1 inch standoffs. Adaptors on spindles for gauge change. swivel inwards for neater 400 foot / 120 metre spool usage. 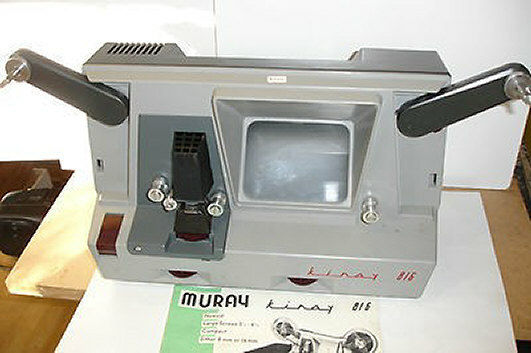 The Muray 9.5mm animated viewer model M or MHB - think the MHB had a metal shade and brighter screen. Probably mid. 1950s on. 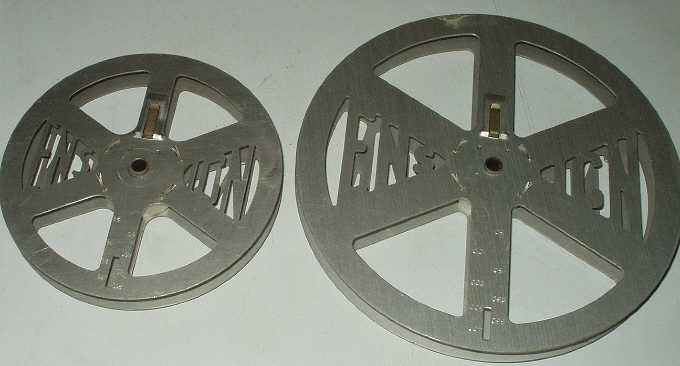 Versions for 8mm / 9.5mm / 16mm. also supplied in 8mm and 16mm models. Rewinders and baseboard included, or as extras. Still available up to the mid. 1960s. the animated viewer behind is a model Luxe but this I think, is a later model, with an even larger screen. up to 400 foot / 120 metre spools, built-in rewind. A neat idea - picture not bad. Obviously mainly 8mm & 16mm versions. for use holding film clips whilst editing; back of the case has spaces for bottle of film cement and mains lead storage. 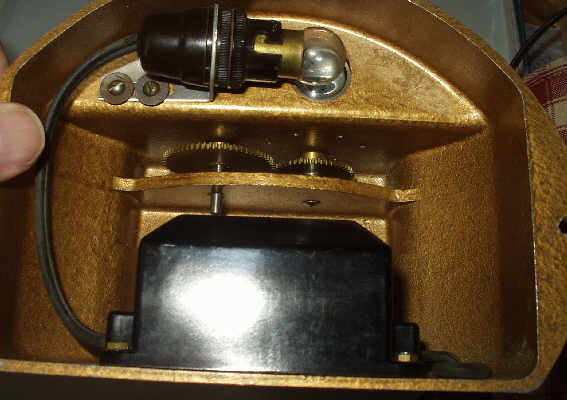 Lhs red button mains on/off; red edge screw on mechanism, focussing; those on bottom for adjusting the internal mirrors. whilst the lower grey plastic (earlier metal! ), moulding pulls out for gate, revolving prism & lens cleaning. (A cotton bud is ideal). Although the fitted mains lead is two-core, there is really nothing to earth - all plastic! Two screws hide in the storage areas at the rear to remove the back cover - useful for cleaning the various mirrors. I notice the lamp transformer on this example is correctly marked 240 volts for the UK. worth converting to a modern QI type. Handle is on the side by the way! Mine works quite well. just slides in and the screw replaced. I assume there must have been adaptors on the spool arms for the other film gauges. 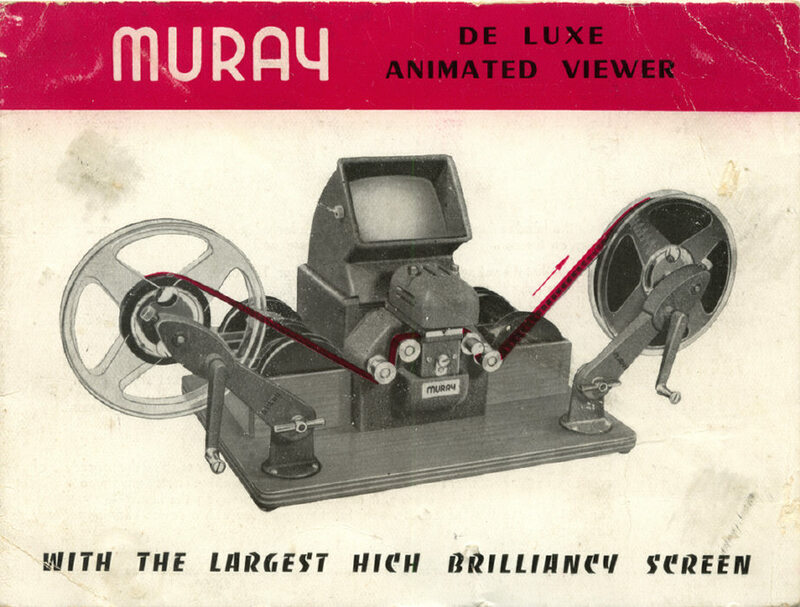 The Muray Teleray 9.5mm animated viewer is a nice piece of kit - big, bright picture - essential for editing films! It takes 400 foot / 120 metre spools and has interchangeable mechanism blocks sinilar to (but not the same as), the Kinay 8/16. and part sides of the condenser and main lens. The spool arms fold back to reduce the size a bit, but this is quite a beast! There is a built-in fan just behind the lamp to keep everything reasonably cool. is metal sliding into the electrical connections. Maybe a problem to fit an alternative QI G4 lamp base! Measured voltage on load appears to be around 13 volts AC - this won't do the lamp life a lot of good! 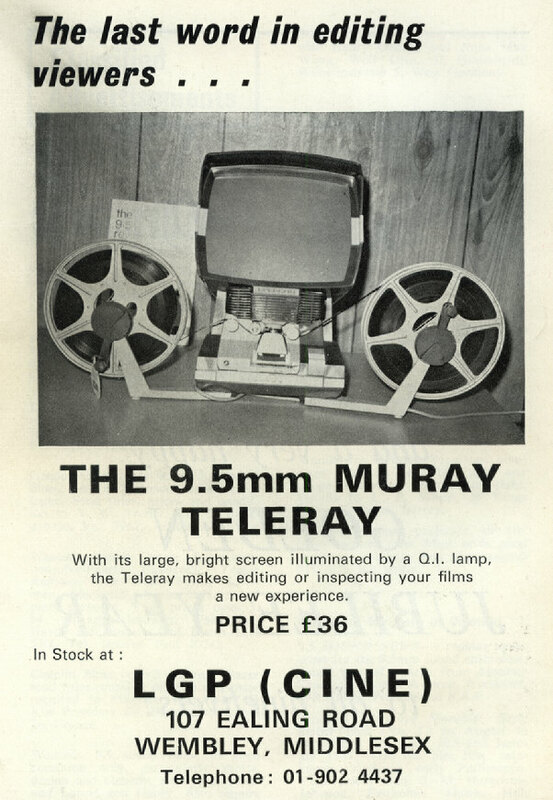 Quite a late arrival on the 9.5mm cine scene - advert in the December 1971 Group 9.5 "The 9.5 Review"
Muray Titray 8 Cine Film Title Outfit - stand, lights, wipes, rotating titles, running titles, close-up lens, titling letters etc. Had wanted one since I was a teenager. Just need some filmstock now to play with the thing! Yes - got it recently on e-bay - reliving my teens I guess! No need for the close-up lens - ingeneously, the camera lens is unscrewed (std 8mm "D" mount) then refitted to the camera through the stand - this aperture is exactly the thickness to set the lens focus for the camera to title distance - very clever. This may just work for similar 9.5mm cine cameras - the "H"; "National 11" and "Prince" all have interchangeable screw mount lenses - the same thread as std 8mm (well Pathé were by far the first to use what they called 'Pathé "H" mount' - which later became the std 8mm "D" mount.). I can see I need to do some tests! amateur movie magazine had mentioned using one. Another UK company that distributed photographic products. Certainly in business in the 1950s and 1960s. Another (pre and post-war?) 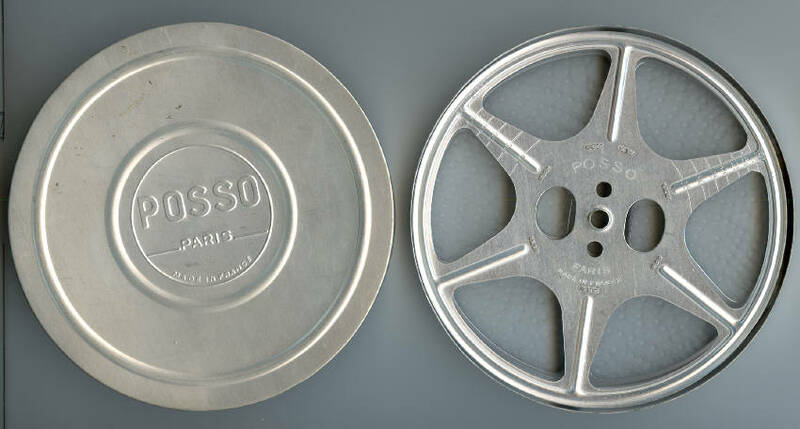 French company whose cine products included plastic, aluminium and metal/plastic spools. I had forgotten Posso until I came across a 9.5mm 50ft / 15m plastic spool with some French stuff. Yes! 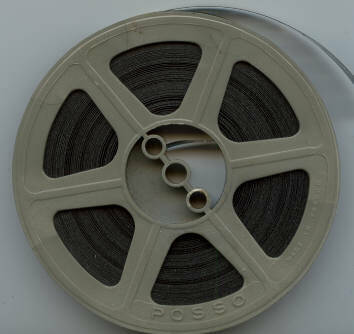 it looks just like the Pathéscope spools that the processed 9.5mm films were returned on from the mid 1950s onwards. No doubt Pathéscope got theirs made by Posso in France. I think there were also 100 foot / 30 metre similar grey plastic 9.5mm spools. 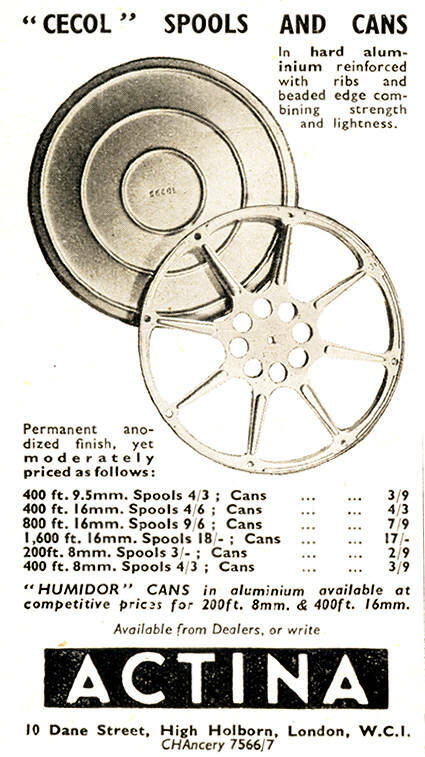 Later a range of 200 foot / 60 metre and 400 foot / 120 metre 9.5mm cine spools were imported. In fact, for a while I had a small stock of new 9.5mm 200 foot and 400 foot spools and cans on my sales lists. Those were the days! A quick 'google' shows that 'Posso' used to make little scales, for weighing letters before posting. Later in France they distributed lens filters etc., camera carry straps, tripods, flash guns and other photo accessories, including 35mm colour slide storage boxes and viewers. . 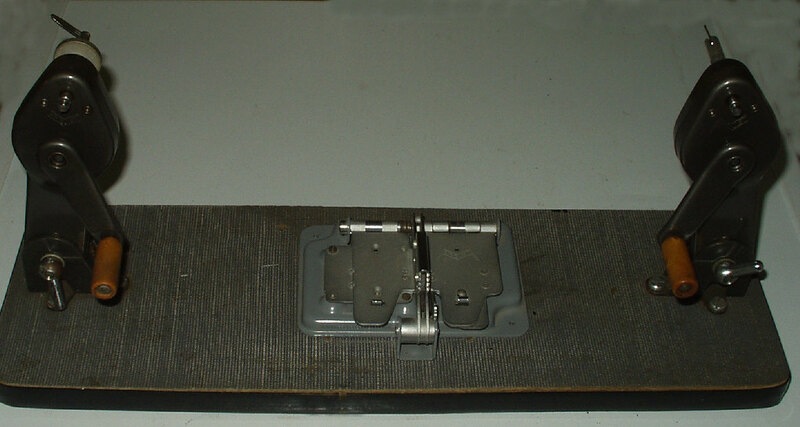 Seems they also offered a tape splicer similar to the later CIR product. 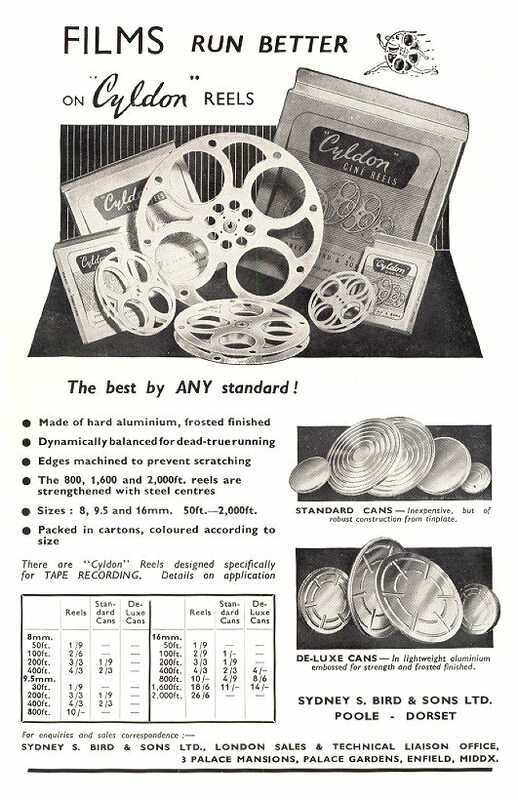 I myself used to like their 8mm / Super 8mm film spools, including the larger 600 foot and 800 foot / 240 metre varieties - don't remember seeing any larger 9.5mm Posso spools that big though! More recently their plastic mouldings have included video and tape cassette storage boxes, but I think not distributed in the UK. Premier was (is) mainly linked to film / cinema professional users. 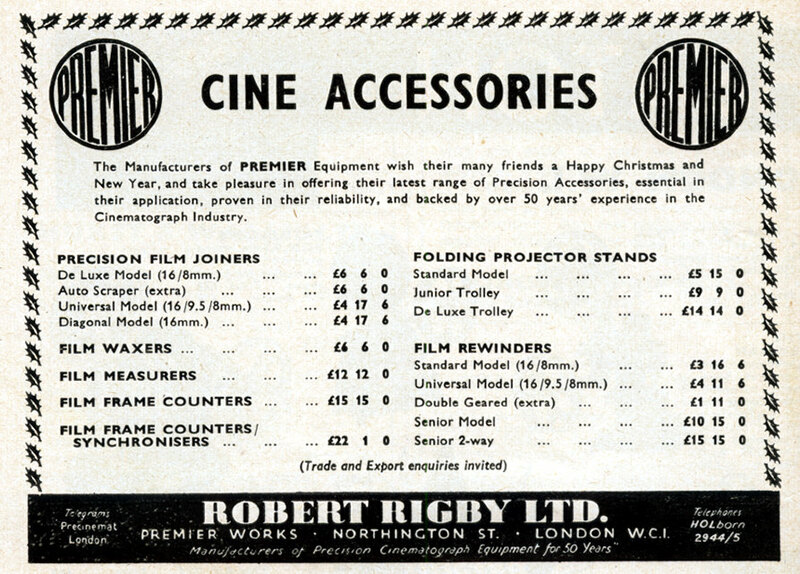 Their accessories probably began in the 1950s - film splicers, rewinders, strong projector stands etc. all decent metal castings, handles, spindles and bearings designed for hard use and long life. However some products were for the top end amateur user, so that a splicer and rewinds were available for the 9.5mm user. 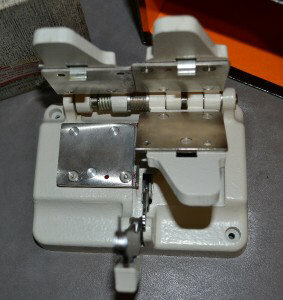 Premier Film Splicer Universal Model - (16/9,5/8mm) - sturdy well made splicer, but quite heavy - ideal for continuous use! This company always called their film splicers 'film joiners'! 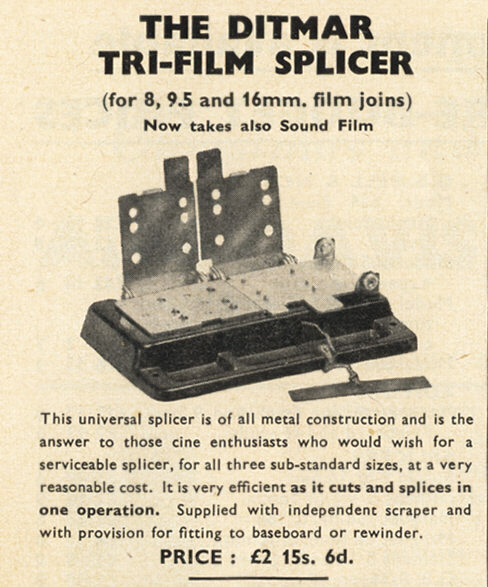 I suppose that is exactly what a film splicer does! 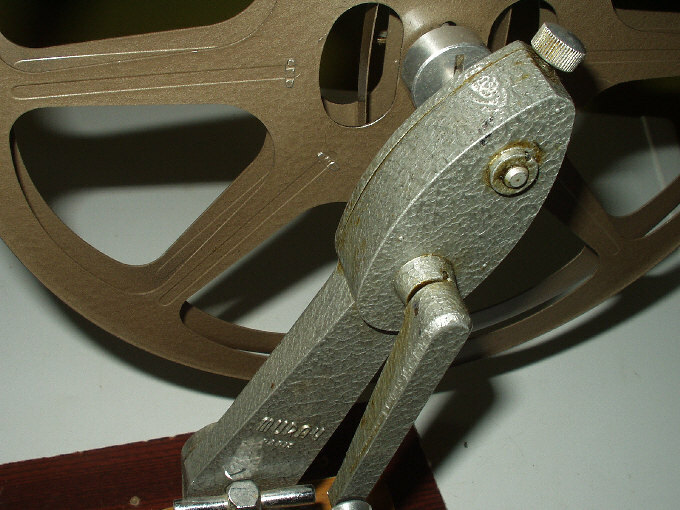 Premier Film Rewinder - Universal Model (16/9.5/8mm) - adaptors for each film size - but main spindle too large for 9.5mm, so adaptors stick out a bit. 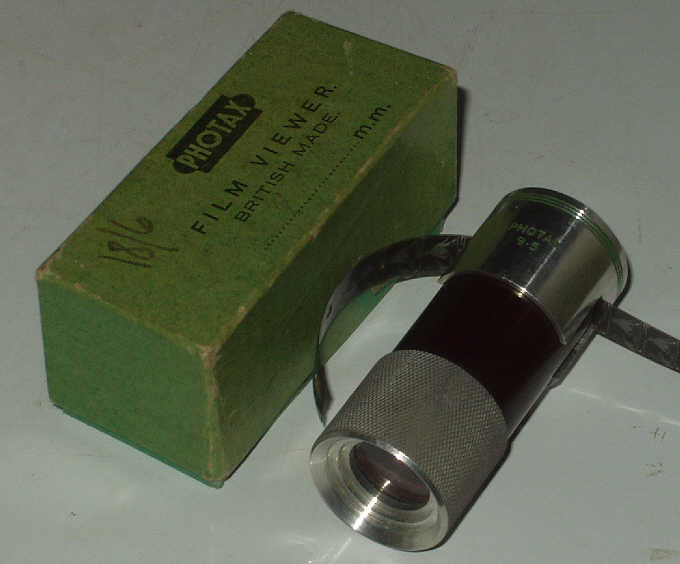 Premier Film Inspection Viewere - A simple non-animated viewer with magnifier. Just a mains lamp in the base I think - suitable for all film gauges really. See the illustration in the advert above. Not seen one myself yet. Originally Barnett-Ensign, well known for their excellent lenses and still cameras. Products were originally badged 'Ensign', then in the early 1950s I guess, now badged 'Ross Ensign'. 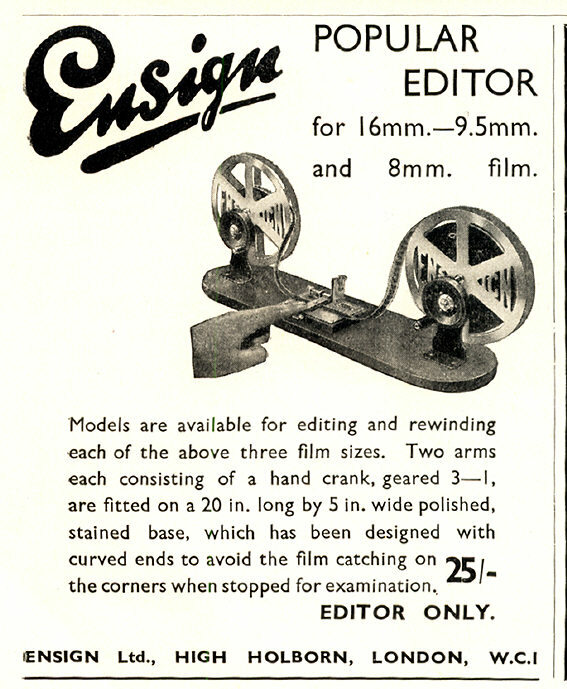 As 'Ensign' in the 1930s, in addition to various still cameras they began manufacturing cine accessories - rewinders, spools and film splicers. 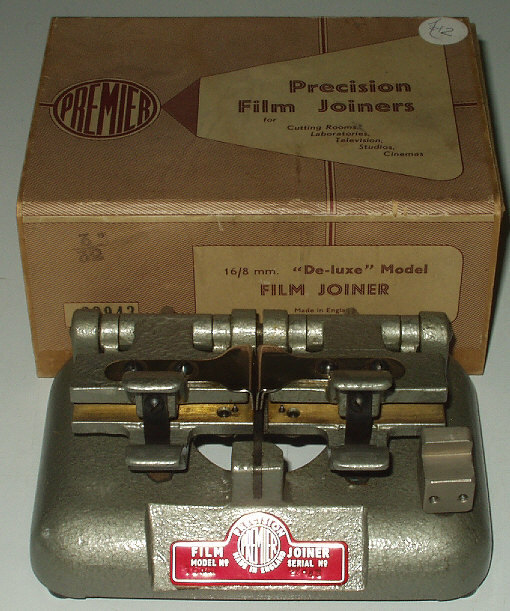 They produced two cement type film splicers - the "Popular" in separate models for 8mm, 8.5mm and 16mm. There was also an upmarket "Universal" to suit all three film gauges. 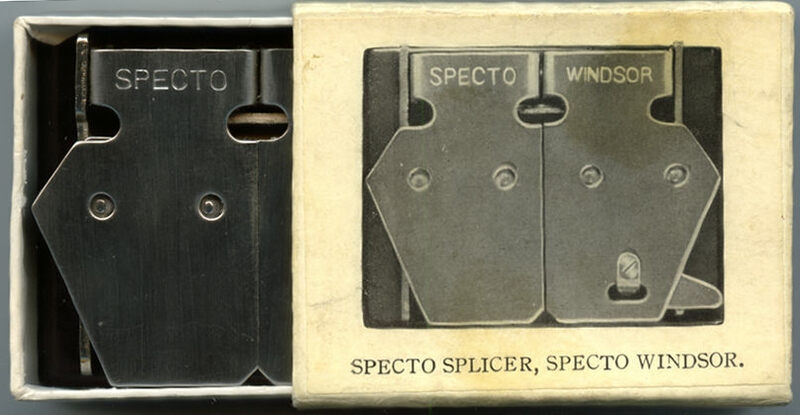 I myself started with a 9.5mm "Popular" around 1957, purchased when the company had closed down and Wallace Heaton were selling off these splicers at 9/6d each - wow! 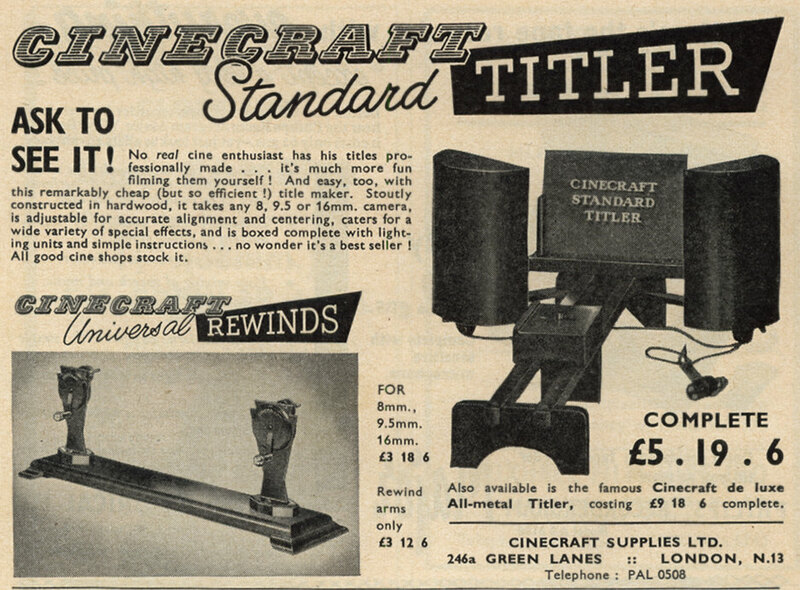 Whilst I have come across adverts for film rewinders in the 1930s, I haven't seen rewinders included in later adverts of the 1940s and 1950s. Maybe they were phased out after WW2. In fact I have never yet come across a set of Ensign rewinds - there's still time! 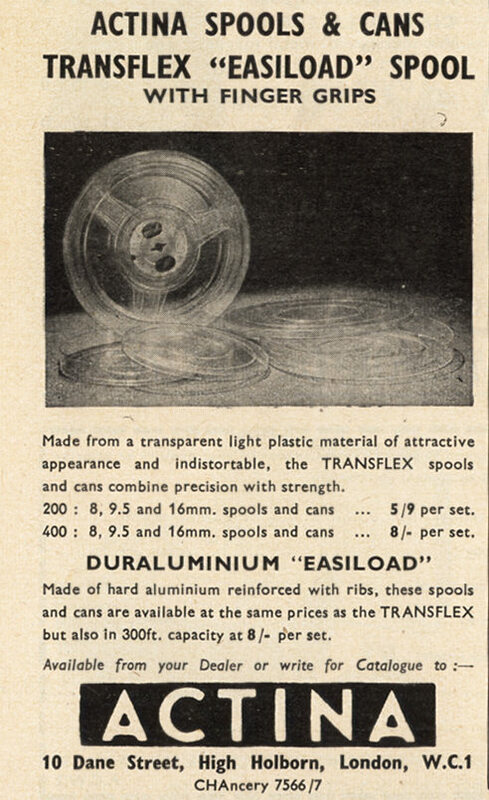 in aluminium with the maker's name clearly included in the spool sides! There was a flip down clip to secure the film. Well known UK projector manufacturer, later into cameras, slide projectors etc. 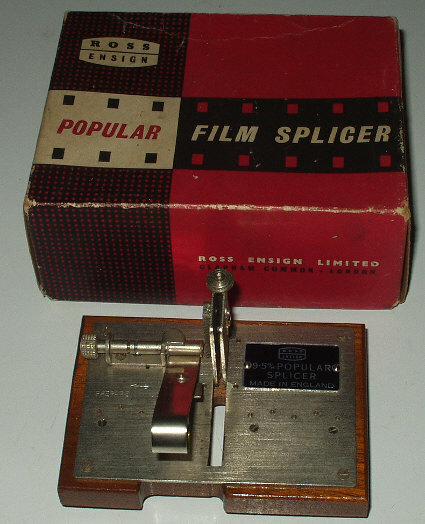 But yes they did supply a 9.5mm film splicer- I do have one!